Several current and former educators and political insiders in Hudson County claim teachers are pressured to make political donations to a campaign fund linked to North Bergen Mayor Nicholas Sacco. Some said their jobs and promotions can be affected by whether and how much they give. Jonathan Dienst reports. It is a charge Sacco and his spokesman deny, as they called News 4 "liars" and "incompetent"
Several current and former educators and political insiders in Hudson County claim teachers are pressured to make political donations to a campaign fund linked to North Bergen Mayor Nicholas Sacco. Some said their jobs and promotions can be affected by whether and how much they give. "I think upward mobility is limited in the workplace if you don’t play ball," said one insider speaking on condition of anonymity fearing retaliation. "If you are expected to participate and you don’t participate, you may receive a phone call from the highest walks of power." It is a charge the Democratic mayor and his spokesman deny. "They are liars. They are incompetent," Sacco said of the News 4 New York I-Team to a room of fellow Hudson County democrats in a recording provided to the I-Team. The mayor of North Bergen, who for years also served as a leading school administrator, has 10 relatives working for the education system, an affiliated public technology school, and the town, according to public records. Jonathan Dienst reports. The I-Team did a search for all political donations in New Jersey where the contributor reported being a teacher or working for any board of education in the state. Since 2010, there are a total of 11,000 contributions statewide. More than 6,000 of those went just to the political committee closely linked to Sacco. That is more than half of all individual education-related donations in the state. North Bergen ranks 23rd in population in the state. Yet over that same nine-year time period, we found 317 individual donations in New Jersey’s three largest cities – Newark, Jersey City and Paterson – compared to more than 6,000 in North Bergen alone. When the head of the state teacher’s union was showed this data, she said it is a big concern. "Our students' education is too important to play politics with," Donna M. Chiera, president of the American Federation of Teachers New Jersey, said in a statement to News 4. "Educators… should not be coerced to donating to campaigns with the promise of favor or threat of retaliation." Chiera called for "employment based on qualifications, credentials and merit rather than nepotism, cronyism or donations to political candidates." 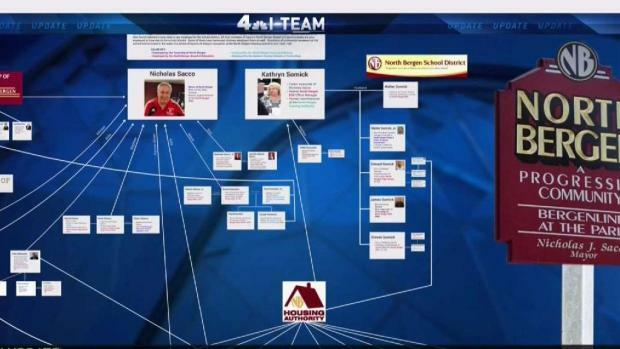 Questions about education-related donations in North Bergen come after the I-Team previously mapped out a political network where dozens of Sacco relatives and associates have jobs in the North Bergen Schools and the Hudson County Schools of Technology. In addition to serving as mayor for decades, Sacco is also a state senator and also spent years as a top administrator at the North Bergen schools. "As with any political entity … if the work is stable and the career path is a good one, family members are often likely to follow … into the same career paths," said Sacco spokesman Phil Swibinski. The I-Team was sent an audio recording of the mayor recently addressing Hudson County Democrats about the News 4 I-Team reports of alleged cronyism and corruption. Sacco appeared to be giving attendees talking points if contacted by the News 4 I-Team. "'You’re either totally incompetent or totally corrupt.' One or the other. OK, that’s both response to them," Sacco said. "They are not your friends. They will twist what you say." The mayor and his team continue to contend News 4 is cooperating with his political rival Larry Wainstein and a convicted felon named Joseph Mocco. That is false. "Channel 4 is denying it … They are behaving like criminals," Sacco said. Sacco’s spokesman had said an I-Team producer was even spotted at Wainstein’s offices on June 4. That is also false. Weeks after the mayor’s team raised that false allegation, News 4 found security camera video of June 4. No NBC employee is seen, and the I-Team has never used Larry Wainstein or Joseph Mocco as a source for these stories. "We saw David Paredes, the guy putting it together, right outside Wainstein’s headquarters. He came and took a tape from the business across the street before we knew there was a tape across the street." The mayor told his fellow Democrats he wants to know exactly who is talking to News 4 New York. 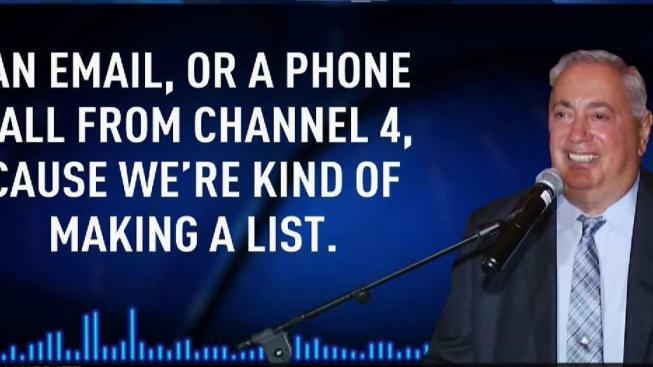 "We wanna know if anyone here got either a text, or a phone call, an email from Channel 4 'cause we’re kinda making a list," he said, adding, "But if you did get notified, if you are on that list, give it to Paul Swibinski, he's here. So we know... 'cause we may decide to do some of our own responses back to them." To date, a spokesman for NJ Attorney General Gurbir Grewal has declined to comment on the corruption allegations or discuss if any investigation is now underway. Spokesmen for the FBI and US Attorney also declined to comment.